The answer to the question "who created Mickey Mouse?" 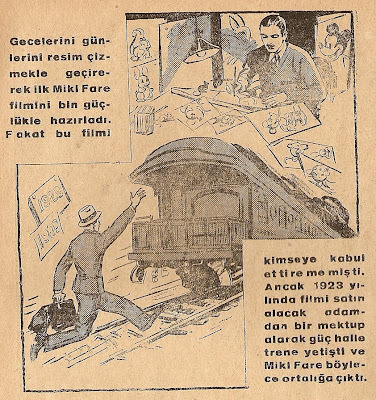 might not be as straightforward what the above illustration (scanned from a 1938 Turkish publication, but almost certainly of non-Turkish origin) suggests. Mickey was created as a replacement character for Oswald the Lucky Rabbit, Disney Studio's previous cartoon hero, after Disney was confronted by its distributor that they, and not him, had its exclusive rights. The story goes that on the train back to Hollywod after the traumatic meeting with the distributors, he came up with the idea of a mouse character (initially to be called as Mortimer, a name promptly discarded in favor of Mickey), inspired by "a little mouse which used to crawl over his drawing board while he worked in his garage studio" earlier in his career. 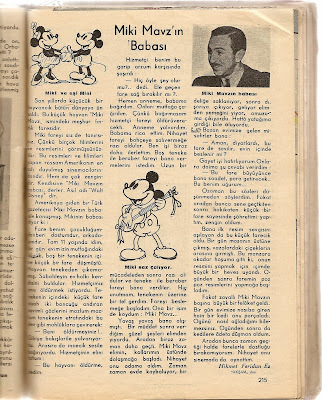 The earliest printed version of this account that I came across (via scans of which were recently posted at http://disneybooks.blogspot.com/) was in a NYT article from 1938 (if anyone knows earlier publications, please let us know). Over the years, this story has been canonized as the account of Mickey's creation, but recent critical studies (such as M. Elliot's Walt Disney: Hollywood's Dark Prince from 1993) also point to the role of Ub Iwerks, Disney's junior partner and leading animator at the time, who is now generally accepted as the hand who must have designed and drawn the first models of Mickey Mouse. The Iwerks version claims Mickey was picked up by Walt Disney from several new cartoon hero options designed by Iwerks, and hence disputes the validity of Disney's train story version. The full truth can probably be never known for certainity and might as well lie somewhere in between the two versions. Anyway, the real rationale of this post is bringing to light a curious (and probably spurious) variation of the Disney version and all the above was only meant as an introduction to put it in context. On morning, when Walt was a kidand still living with his parents, the household found a small mouse in a big and empty tin can in the kitchen. Walt pleaded with his parents to be allowed to keep the mouse alive in the bucket and was granted his request. He named the mouse Mickey and began to feed him there. Slowly, Mickey got used to Walt and he took him to his own room, giving him free reign. When visitors to their house would be amazed at the idea of keeping a mouse as pet, Walt would say that Mickey was his luck and would bring him happiness and fortune in the future. One day, the mouse was strolling among the flowers in a pot and Walt liked this miseance so much that he drew a picture of it and from then onwards took a growing interest in drawing. Eventually, Mickey would be killed by a cat. As noted above, the canonic legend about the origin of Mickey Mouse traces his root to a mouse Walt had befriended during his Kansas animation studio era, not during his childhood. I am very eager to know if there have been any other printed accounts in line with the above account involving Walt’s childhood? Hikmet Feridun Es (1910-92) was indeed a globe-trotting Turkish journalist who published a series of articles about Hollywood. But I would not bet if he really interviewed WD in person or just somehow made this up.